Comments: Orders ship SAME or NEXT business day. Brand new. ISBN 0131014161 Physics (C.)2004 New Inventory. To the Instructor Teaching introductory algebra-based physics can be a most challenging--and rewarding--experience. Students enter the course with a wide range of backgrounds, interests, and skills and we, the instructors, strive not only to convey the basic concepts and fundamental laws of physics, but also to give students an appreciation of its relevance and appeal. I wrote this book to help with that task. It incorporates a number of unique and innovative pedagogical features that evolved from years of teaching experience. The materials have been tested extensively in the classroom and in focus groups, and refined based on comments from students and teachers who used the first edition. The enthusiastic response I received from users of the first edition was both flattering and motivating. The second edition has been enhanced and enriched in response to this feedback. Learning Tools in the Text A key goal of this text is to help students make the connection between a conceptual understanding of physics and the various skills necessary to solve quantitative problems. One of the chief means to that end is the replacement of traditional "textbook". Examples with an integrated suite of learning tools: fully workedExamples with Solutions in Two-Column Format, Active Examples, Conceptual Checkpoints,andExercises.Each of these tools performs some of the functions of a standard Example, but each is specialized to meet the needs of students at a particular point in the development of a chapter. These needs are not always the same. Sometimes students require a detailed explanation of how to tackle a particular problem; at other times, they must be allowed to take an active role and work out the details for themselves. Sometimes it is important for them to perform calculations and concentrate on numerical precision; at other times it is more fruitful for them to explore a key idea in a conceptual context. And sometimes, all that is required is practice using a new equation or definition. A good teacher can sense when students need a patient, step-by-step exposition and when they need only minimal reinforcement; when they need to focus on concepts and when they need an opportunity to practice their quantitative skills. This text attempts to emulate the teaching style of successful instructors by providing the right tool at the right time and place. Worked Examples with Solutions in Two-Column Format Examplesmodel the most complete and detailed method of solving a particular type of problem. The Examples in this text are presented in a format that focuses on the basic strategies and thought processes involved in problem solving. The aim of this approach is to help students first visualize the situation, devise astrategyto be followed, and then implement a clearstep-by-step solutionto the problem. This focus on the intimate relationship between conceptual insights and problem-solving techniques encourages students to view the ability to solve problems as a logical outgrowth of conceptual understanding rather than a kind of parlor trick. Each Example has the same basic structure: Picture the Problem.This first step discusses how the physical situation can be represented visually and what such a representation can tell us about how to analyze and solve the problem. At this step, always accompanied by a figure, we set up a coordinate system where appropriate, label important quantities, and indicate which values are known. ThePicture the Problemsteps have been enhanced in the second edition to make them more instructive. Strategy.Closely linked with this visualization process is the formulation of aStrategyto be followed in solving the problem. The strategy addresses the commonly asked question, "How do I get started?" 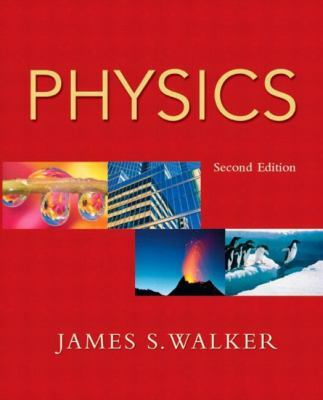 by providing a clear overview of the problem and helping students toWalker, James S. is the author of 'Physics', published 2003 under ISBN 9780131014169 and ISBN 0131014161. Loading marketplace prices 28 copies from $3.31 How does the rental process work?